The pepper and water science trick is one of the easiest magic tricks you can perform. Here's how to do the trick and an explanation of how it works. You only need a few common kitchen ingredients to perform this science magic trick. Pour water into a plate or bowl. Shake some pepper onto the water's surface. Dip your finger into the pepper and water (Nothing much will happen). However, if you put a drop of dishwashing liquid on your finger and then dip it into the pepper and water the pepper will rush to the outer edges of the dish. If you are doing this as a "trick" then you might have one finger that is clean and another finger that you dipped in detergent before performing the trick. You could use a spoon or chopstick if you don't want a soapy finger. When you add detergent to water the surface tension of the water is lowered. Water normally bulges up a bit, like what you see when you look at a water drop. When the ​surface tension is lowered, the water wants to spread out. As the water flattens on the dish, the pepper that is floating on top of the water is carried to the outer edge of the plate as if by magic. What happens if you mix detergent into the water and then shake pepper onto it? 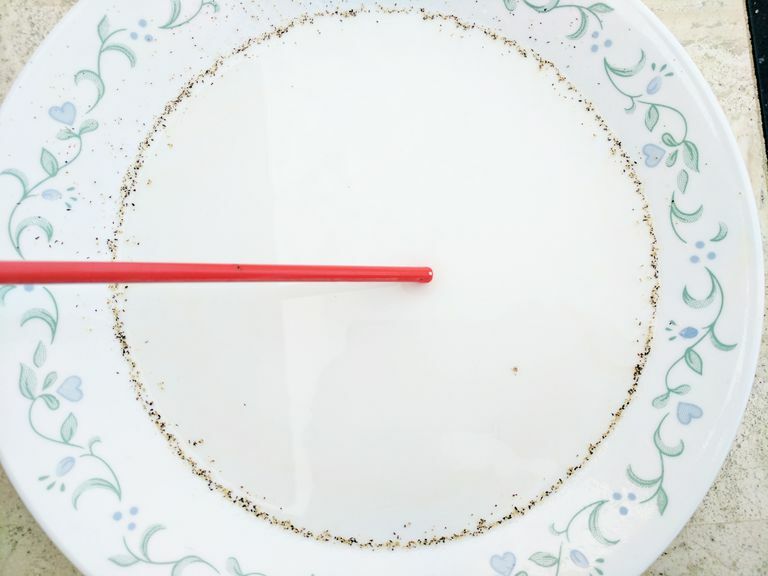 The pepper sinks to the bottom of the plate because the surface tension of the water is too low to hold up the particles. The high surface tension of water is why spiders and some insects can walk on water. If you added a drop of detergent to the water, they would sink, too. A related science-based trick is the floating needle trick. You can float a needle (or paperclip) on water because the surface tension is high enough to hold it up. If the needle gets completely wet, it will sink immediately. Running the needle across your skin first will coat it with a thin layer of oil, helping it to float. Another option is to set the needle on a floating bit of tissue paper. The paper will become hydrated and sink, leaving a floating needle. Touching the water with a finger dipped in detergent will cause the metal to sink. Another way to demonstrate the high surface tension of water is to see how many quarters or other coins you can add to a full glass of water before it overflows. As you add coins, the surface of the water will become convex before finally overflowing. How many coins can you add? This depends on how you add them. Slowly sliding the coins into the water edge-on will improve your results. If you're competing with a friend, you can sabotage his efforts by coating his coins with soap.